The Walker County Historical Commission refers to Huntsville, and more specifically Sam Houston’s Woodville home, as the Mount Vernon of Texas. For anyone who enjoys history, that’s more than enough to plan a visit! All Texans, and some of us less fortunate, know that the name of Sam Houston is bound to the Battle of San Jacinto, the final victorious battle in the fight for Texas independence. 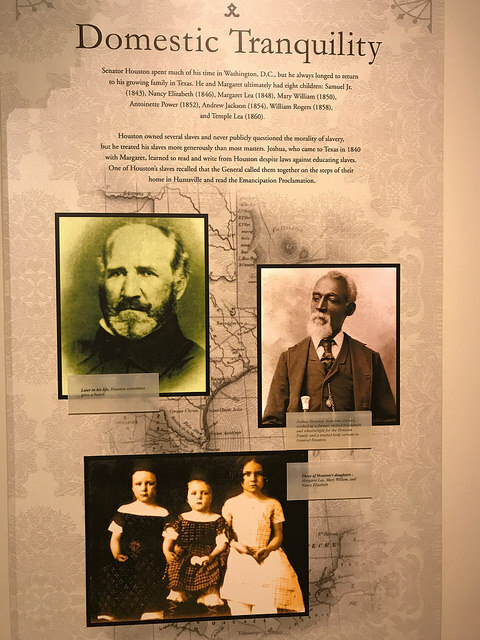 Houstonians certainly recognize the name of the man whose actions inspired the use of his surname when a small settlement on Buffalo Bayou was in need of a name in 1836, the year the Battle of San Jacinto was won just a few miles to the east of the city. What fewer people are aware of is Sam Houston’s equally strong association with the town of Huntsville, 70 miles north of Houston. Huntsville came into being around the same time the concept of an independent Texas began to take shape. Founded by Pleasant and Ephraim Gray as an Indian trading post, the brothers decided to name the town after their family’s home town in Alabama. By the time Sam Houston decided to make Huntsville his home, he had already served two terms as President of the Republic of Texas and laid the ground work for Texas to be admitted to the United States. Texas became the 28th state three days before the arrival of 1846. By this time, Houston had already moved his family to Raven Hill Plantation, just a few miles northeast of Huntsville. I must admit that I find Sam Houston a larger than life figure, and I know that I’m not alone in that. The ability of a single person to fit so many stories, adventures and accomplishments into one lifetime boggles the mind. The hero’s mantle seems to settle so easily on Sam Houston’s memory. His legacy is easily romanticized, and yet, we all know that a person without flaws is an impossibility. Despite the acknowledgment that he must certainly have been an ambitious man with plenty of self-serving motives, my interest in his story remains and I look forward to visiting the place where he spent more than 10 years of his life. When my daughter and I arrive in Huntsville, we drive through town toward Oakwood Cemetery, with an idea that we’ll visit Sam Houston’s grave. Not having researched it ahead of time, I’m imagining an old graveyard of manageable size. Instead we discover a very large area, divided by neighborhood roads. I’m not able to locate a parking area, so we decide to come back at another time. For now, the thought that his body rests here, so close by, seems to suddenly make him more real. 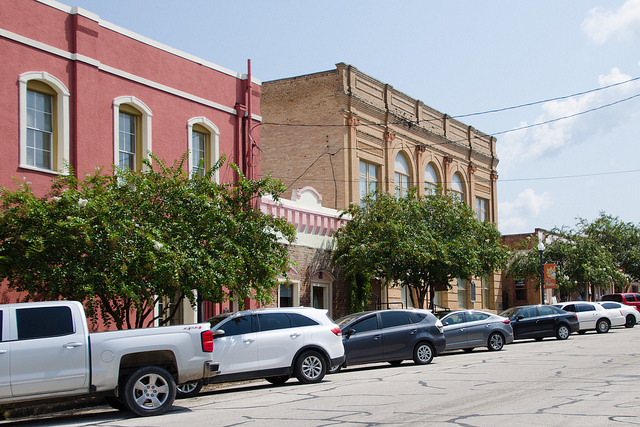 Before visiting the Sam Houston Memorial Museum, we choose to park the car and see the town. The fact that it sits at the top of a hill adds a bit of unexpected charm. The town itself has a slightly tired look, with empty buildings here and there. 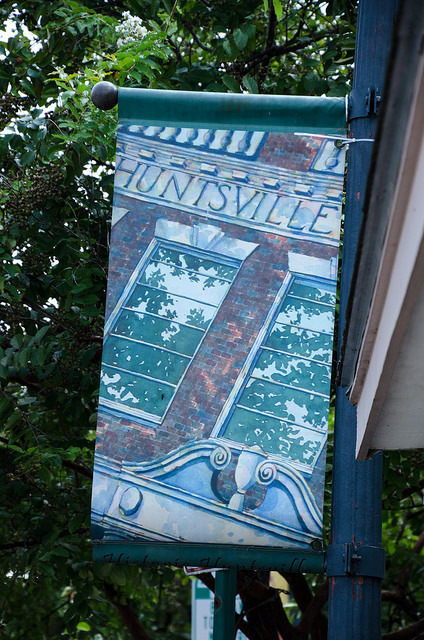 Having listened to old audio recordings of Huntsville residents describing town life in the early 1900s, I know it was once very different. Whether born as members of the upper class or the children of slaves, I’m struck by how refined these voices are. The speech patterns they share, which reveal much older southern intonations, is a reminder that the world we inhabit today once belonged to them. The town’s 1947 movie theater stood empty for a few decades before restoration began in the late 1990s. Today it again serves as a hub for the community. For me, there always seems to be a sweetly sentimental air lingering about these old buildings which once provided so much fun and enjoyment. 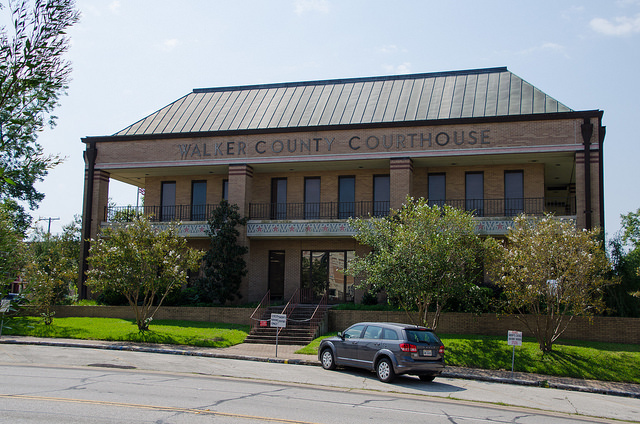 The 1970 Walker County courthouse is a building of modern design. Surprisingly, it is the fifth courthouse to be built here. It replaced a much grander structure, built in 1889, which was lost during a fire in 1968. At that time, it was among the 25 oldest courthouses in the state. Interestingly, when the damaged courthouse was removed, the bricks were taken to the River Oaks area in Houston and used in the building of a home there. The very first courthouse on the site was built in 1850, during the years that Sam Houston was in residence. 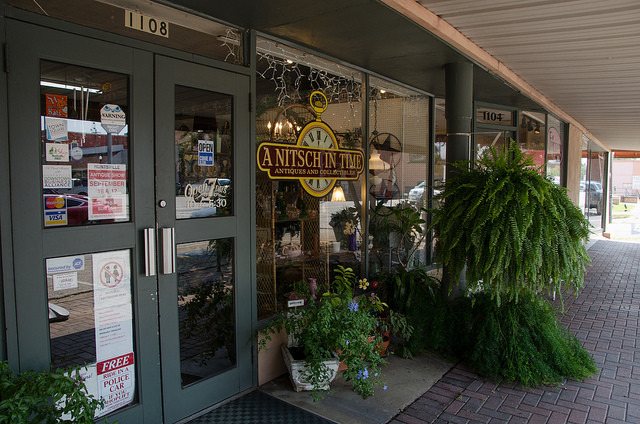 On the northern side of the square sits a store with a historical marker out front. 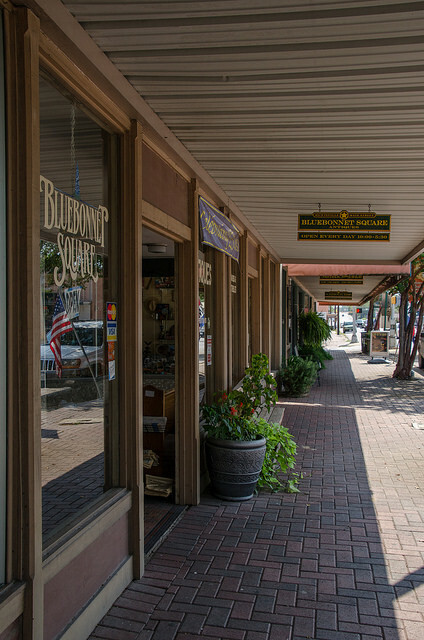 We’ve just discovered the “oldest business in Texas under original ownership and on first site”. 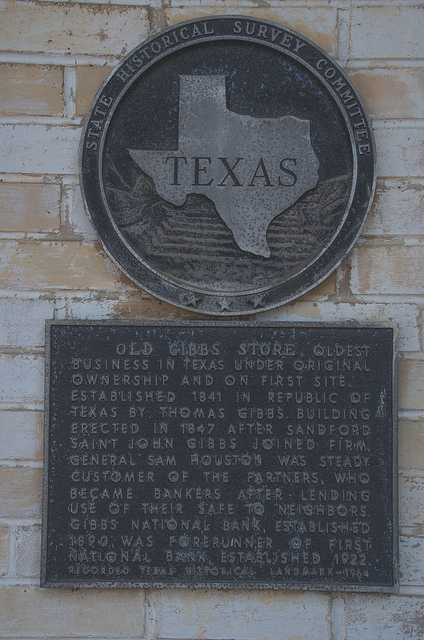 It was built in 1847, which means that Sam Houston, who was a regular customer of the Gibbs Store, would have been living here when it was constructed. Now that we’re well into the afternoon, the search for a local eatery begins. A quick internet search tells us that Farmhouse Cafe is right down the road and, most importantly, they have some very favorable reviews. A bowl of bread arrives at the table soon after we’ve been seated. I normally try to avoid filling up on bread before a meal but the broccoli filled cornbread looks too tempting. All I really need to tell you is, it’s very likely that I will just ask for a platter of cornbread the next time we visit. This coming from someone who is not normally a big cornbread fan. The potato soup that follows our cornbread indulgence is light and flavor filled. We leave with all the energy necessary for an extended stroll through the grounds of the Sam Houston Memorial Museum. I’m going to be helpful and tell you that when you arrive at the museum by car, do go ahead and use the footpath entrance. It’s actually a road. I spent some time trying to find the main entrance road until I realized that it was cleverly camouflaged. This isn’t intended as criticism as I actually agree that there’s no need to cover up the green areas with more asphalt than is strictly necessary. 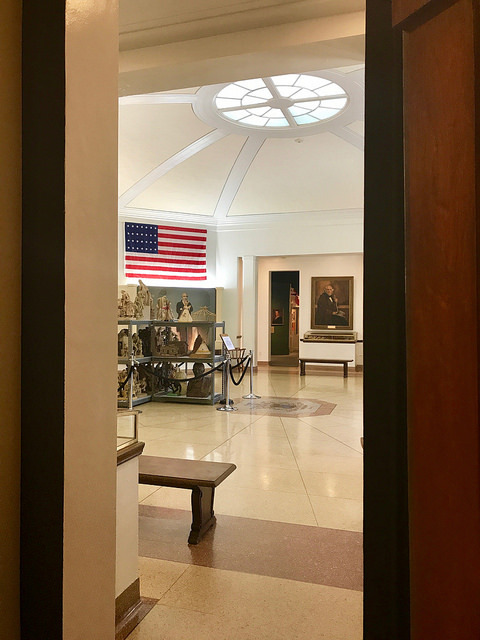 The Sam Houston Memorial Museum consists of not just the domed museum building containing artifacts from Sam Houston’s life but also includes the open-air museum that surrounds it. 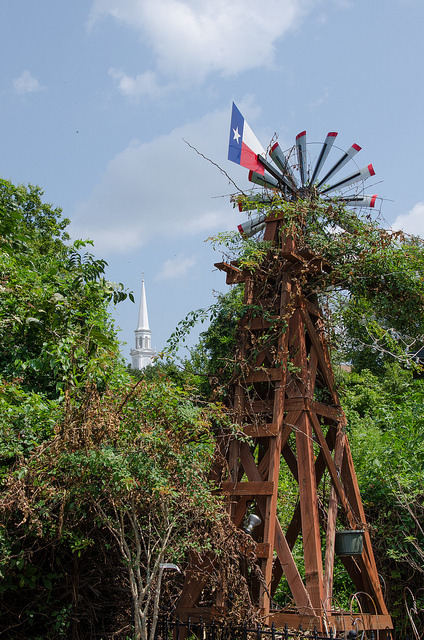 The eighteen acre property actually sits within the two hundred-plus acre property that once belonged to Sam Houston. The central focus of the museum, in my opinion, is Woodland, the home that Houston had built and that he shared with his wife Margaret and his seven children. Their eighth and last child was born after they left this home, and that child also happened to be the first child born in the Austin governor’s mansion. The museum offers a rare opportunity of not only learning about Sam Houston’s history but also of literally walking in his foot steps. It’s one thing to understand the factual progression of events of someone’s life, it’s another to emotionally connect with the places they would have interacted with. It is not possible to step inside any of the buildings on the property, instead all the doorways and windows are covered by plexiglass, making it possible to look into all the rooms. Filled as they are with period furniture and everyday objects, there’s much to learn about life in the 1840s and 1850s. While Houston lived here, his home was considered sufficiently far from town to be thought a country home. During his time here, however, a large structure was erected not far away. The campus of Austin College was built in 1851-1852. The college moved a few years later, which allowed another to take over the building. In 1879, The Sam Houston Normal Institute took up residence and remains to this day, though it’s now known as Sam Houston State University. The aforementioned audio recordings taught me that back at the beginning of the 1900s, students at the school used to be referred to as Normals. The year after Houston left Huntsville, he was inaugurated as Governor of Texas. Two years later, Texas chose to secede from the Union. When Governor Houston refused to take an oath of allegiance to the Confederacy, he was deposed. Soon thereafter, the Union offered him a 50,000-man army to fight the Confederates. He refused the offer. Sam Houston returned to Huntsville, the target of a great deal of resentment. He died of pneumonia six months later. His tombstone was small and unadorned, his simple casket built by prisoners of war that he had befriended. It took some time and required a period of healing, but eventually Texas forgave Sam Houston and was able to again appreciate his many contributions to the state. His gravestone now is one that reflects the gratitude of his compatriots’ descendants.